The town was surrounded by a ring of tall, dark, wooded hills. Heavy, dank clouds hovered over the narrow valley, permitting not a single ray of sunlight to pass through. The townsfolk were born, they lived—and they died—in the “vale of tears,” as the place was sometimes called. They had no notion that out there somewhere there were happy, sunlit places. But, one spring day, a wondrous stranger wandered into the dark valley. Seeing their atrophied, joyless life, he told them about his homeland: a place of sunlight, of fresh air, of joy and song. Hardly anyone believed that there really was such a place. “That is the land to which I will take you,” the wondrous man called out to the stunned people of the valley. From time to time their leader would refresh their memories, recalling that glorious morning when they had seen the mount with their own eyes. On these occasions, they could “see” again the top of the mount bathed in sunlight. And the remembrance gave them the strength and faith to sustain them until that glorious day when they would actually stand at the foot of the mount. 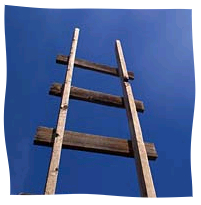 This, say the chassidic masters, is the story of our daily lives: the constant struggle, the exhausting climb up the ladder of perfection, developing the raw material of our being; approaching, yet never quite achieving, wholeness. It is a ladder whose base is fixed in the dark valley of a world where G‑d hides His face, and whose uppermost rung stretches to the wellspring of light. And yet, there are those rare moments of revelation. Moments in which the face of G‑d smiles through the haze, and we glimpse the promised land that is the culmination of our journey. The story of our daily lives is the story of a journey made in darkness, the story of an ongoing struggle with the forces of nature within ourselves and outside ourselves. But without those flashes from Above—without the rays of light that drive away darkness if only for the briefest of moments—we could not survive the tortuous journey and reach our ultimate goal. The prototype of this journey, the template of our sojourn in this world, is Sefirat HaOmer, the 49-day counting of the days from Passover to Shavuot. For 210 years our ancestors lived in darkness. Enslaved by the Egyptians, the most debased society to ever dwell upon the face of the earth, the children of Israel inhabited a spiritual fog which shut off every vestige of manifest G‑dliness. G‑d, of course, could have simply lifted them out of Egypt and brought them to Mount Sinai that very night. But He wanted it to be their journey, their achievement. So after that momentary vision, the face of G‑d receded. Then began the arduous climb to Sinai. The Jews were out of Egypt, but Egypt was still deeply embedded within the Jews. For seven weeks they struggled to refine the seven traits of their souls, to cleanse them of the profanity of Egypt and make themselves worthy candidates for the divine choice. But the revelation of the Exodus is but a brief, momentary flash. On the following day we begin our 49-day trek to Sinai, reenacted each year with the Counting of the Omer. Beginning with the second night of Passover, we count the days traversed from the Exodus, chronicling the milestones and stations of our journey of self-refinement. OMER the echoic connect to Omar, what is heard and O MAR, for SEA. I foresee... We are all counting down towards 0 which is also an expression of the circle, of Zero, but what's sub zero is a story, that is as miraculous as any ever told, because it contains all stories. It's the UNDER I hear, in articulating the word, WONDER itself. It could be, we're all still on Sinai. It could be, the rest is but a dream, but that the echoic connect with ONE, with ECHAD or the echo within as in Echod, is what reverberates throughout our lives, in the various iterations of one, as in The Tree of Life, as in that bite of the apple, as in Apple computers and what we call byte. Once you perceive the intrinsic one ness to all, and that we all Count, as in Counting Up or Down, that there is a connection between up AND down, then you've arrived, and we're holding hands again, as Moses climbs that mountain. a clearing took place giving us the opportunity to have a fresh look at ourselves, our life and our journey. More on the Refinement You write: "For seven weeks they struggled to refine the seven traits of their souls, to cleanse it of the profanity of Egypt and make themselves worthy candidates for the divine choice." Isru Chag I have been Christian all my life, at least until G-d found me (yes, He hides His face!). What a revelation Judaism and Jewish life is. Yes, I agree; it is a beautiful way to explain the experience of liberation and self-refinement. "G-d, of course, could have simply lifted them out of Egypt and brought them to Mount Sinai that very night. But He wanted it to be their journey, their achievement. So after that momentary vision, the face of G-d receded."